Nixon Motor Sports: NMS Announces More Lemons Goodness! Brian down at NMS-South has driven in two 24 Hours of Lemons races so far, and coming up in September he's going to do it again in the 72 Coronet with Team Coronautski. 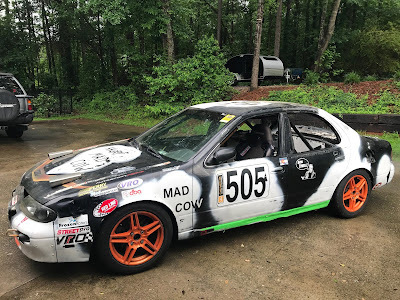 CORONAUTSKI ON FACEBOOK At the same event to be held at Carolina Motorsports Park in Kershaw SC, NMS-North is going to get in on the action for the first time with a new team driving a Nissan Altima. Who will win the NMS Battle for Lemony Supremacy? Will both cars even start on race day? Will the temperatures exceed one bazillion degrees inside the race cars? We'll be covering the race from the inside and report from SC later in September. For now, there's a bunch of racing gear to buy and car stuff to get in working order for both teams. HONEST, A BUNCH OF CARS WILL BE HERE! A cool feature of this race is the Friday night parade and block party, where all the race cars that run will try to drive to downtown Camden, park in one blocked off street, and then you can meet all the teams and laugh at their cars, have a drink, listen to a band, and hang out. This is the only Lemons race in the country with this Friday night fun, so we highly recommend it! The racing action will be on track at CMP Saturday September 15th from 10AM to 6:30PM, and then again on Sunday from 9-11AM and Noon-4PM. NEW ZAMP RACE SUIT! MIGHT NEED SHOES! 5pm: Gates open for early arrivals. 9am-4pm: Pre-race track testing hosted by CMP. 11am-Noon: CMP quiet time. No race motors.